Just wanted to share my purchase of MOTIVES Cosmetics from my talented bro-in-law, Jon Freitas! I'm not a big makeup person however, with a few simple items he was able to make me look glam for my photo shoot with my Abalone Sisters last Friday. High quality cosmetics at a reasonable price! MAHALO NUI LOA, Jon Freitas, for your awesome artistry and your cool MOTIVES MAKEUP Toy Box! At the foot of One of Hawai'i's historic landmarks is The Waterfront - a cool place for your special event!!! You know, The Aloha Tower used to be the tallest building in Hawai'i. In time it's been dwarfed by our own version of skyscrapers however, is still an important part of our Honolulu skyline. Thanks to Kris Labang and Crystal Evans, I had the great opportunity to partake in a photo shoot at the Waterfront to showcase this special venue back in January of this year. Model Alita Kristensen shows off this beautiful Melissa Sweet Verona silk garza strapless a-line gown from The Bridal Boutique. Check out the pleating detail and bow at the neckline. Sweet!!! Leslie Fair's makeup and hair design really accentuates Alita's beautiful features! Kamu Davis joined in on the fun posing as "da groom." Now let me share with you what your event could look like at The Waterfront!!! All the lounge and linen design was done by one of my most favorite hardworking women in the industry Naomi Lee of Les Saisons!!! 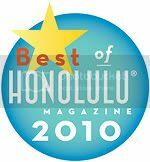 One of my faves - Kahala Caterers (a fellow Honolulu Magazine 2009 Best Of Recipient)! Look at all the brides and grooms who showed up to check out the venue! Here we find Merri Ford, Special Events Coordinator of Kahala Caterers talking with the inquisitive couples. It was a fun filled evening at the Waterfront! Loved bumping into my very good friends like, Da Honeys, Dave Miyamoto and Michelle Guda. My lovely couple, Haunani and Alika, who's celebration is going to take place at the Waterfront on May 2nd of 2009!!! Here's Bryson Dang of the Wedding Cafe, fellow photographer extraordinaires - David Murphey and Derek Wong (LOVE that shirt Derek)! Leslie Fair, Mark Malalis and their friend Dayna for hair, makeup and styling! Kris Labang seen here with Mona Hirata of Weddings by Grace and Mona! Jason of Exquisite Entertainment for hooking us up with the jams!!! Greg Ventura of Advanced Visual Arts - LOVE YOU Bruddah!!! You work so hard!!! Telly for all the dancing lessons!!! Again, the Bridal Boutique and Naomi of Les Saisons!!! Mahalo to my model couple, Alita and Kamu! Thanks for being so fun to work with!!! Yes, it certainly was a fun afternoon and evening at the Waterfront at the Aloha Tower Marketplace!!! Please be sure to check out this cool venue if you're in need of a fun and extraordinary place for your celebration!!! Hairlights at The Wedding Cafe!!! After my wedding the other day, I stopped by one of my favorite places at Ward Warehouse, The Wedding Cafe! I wanted to grab a couple of shots of the beautiful window display that my girls at The Bridal Boutique had just put up. I strolled into the Cafe and to my delight found some very special peeps hanging out! Diva and owner of TWC, Tanna Dang was hanging out with her Godchild, Hunter getting hairlights put into their hair by Sonnie Kerr! I had just recently heard about this newest hair fad from my friend Beth who saw it in coordinator Merrissa Uchimura's hair at a wedding we both worked at together. Hunter was soooo excited to show me the strands of colorful delite that Auntie Sonnie tied into her hair! I watched Sonnie carefully tie more of these strands of BLING into Hunter's hair. You look FABULOUS, dahlink!!! Just like your Auntie Tanna!!! Tanna explained to me that this is the newest retail addition to their Cafe! Awesome deal, girls!!! Even I, non-fashion-Dry-Fit-Clothing-Girl, was taken by the magical shimmer of Hairlights!!! Hi Peeps! I just wanted to share with you one of my most favorite clothing lines: Prana. Comfortable, DURABLE and stylish attire. Check out their groovy sale going on RIGHT NOW! I LOVE cloud formations! In fact, I have a collection of Cloud Art that I'd like to share with all of you in another post. I was just in awe of Ke Akua's creation this morning. What a great way to start the day!!! MAHALO!!! Okay, remember I wrote a post earlier on the beautiful and talented Ms. Wainani Hansen who's running for Miss Hawai'i USA? So today, we detoured from the yoga-pilates-dancing professional Wainani and concentrated on the other sides of Wainani - fabulous, fun and glamourous! Location? Her home town of Kailua! We started off at the Boat Ramp where we were greeted with blue skies, a blanket of white clouds (which really helped to diffuse the light for a very soft look) and thankfully - LOW TIDE! Please note at how warm and sunny it WAS! For her third look, we were surprised to find how dark, WET and grey it was after a wardrobe and makeup change! When unpredictable things like this happen you just go with the flow! It makes a shoot more challenging, creative and fun. 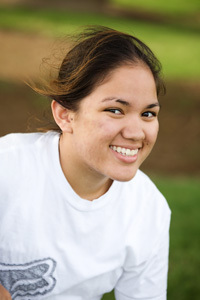 Fortunately, Wainani has such an easy going attitude that she was totally game to just roll. That was fun! In fact, Wainani's "Breakfast at Tiffany's" look really matched this aisle! We just happen to shoot in the breakfast section without even thinking about the correlation. Isn't that cool? After successfully shooting there we checked out the "situation" at the old Kailua Theater. Fortunately, the rain had stopped and we were able to continue on with our shoot. Ahhhh...another fun and successful shoot! - Ke Akua and for a beautiful morning/afternoon! - Ana Velazquez - our makeup and hair diva! Mahalo for your work and mana'o during the shoot. - Mr. Koa Hansen for being so hospitable during our change of wardrobe and makeup. And mom and grandam Hansen for the kau-kau to sustain us! Great opihi!!! - This can of Wrinkle Remover which helped for a quick wrinkle free dress! I had such a fun and creative time with you, Wainani! MAHALO so much for the opportunity to photograph you again! Here's to more laughter, smiles & creative situations, girlfriend! Grand Opening Day for Adoracion Boutique!!!! As promised, I became an official customer of Adoracion Boutique today! After my fun meeting and encounters at Red Ginger Cafe, I wandered over to Adoracion. I was NOT surprised to find that the boutique was crankin' with customers! I really, really love this place! Look at all the cool clothing and accessories! I love these for the babies!!! I wish they had bigger sizes for adults! I walked out of there with my very own REUSABLE purple Adoracion Bag (yes, the boutique is extremely earth conscious). And beautifully wrapped were my Adoracion items which consisted of yes, another pair of SPANKS AND this very cool t-shirt! I should also add that the Boutique does not discriminate on the age of a customer! CONGRATS again to Cheryl DeAngelo and her sister and business partner, Brandy Antonelis! However, this time, Adoracion Boutique created their own version of Prince's hit title. Tonight, the boutique celebrated their pre-opening with a fashion show and partay in purple and black style! Co-owners/sisters, Cheryl DeAngelo and Brandy Antonelis, received their guests in true diva style! I was asked by these two beautiful women to emcee their spectacular event. At first, I exclaimed to them, "What the heck do I know about fashion?!?!? Have you both seen the way I dress????" (I am a fan of Sports Authority and Prana) They reassured me that I didn't have to know anything about fashion and had great faith that I would be able to do the job especially if they dressed me up! Thanks to the creative design of Eddie Ortiz (hair) and my talented bro, Jonathan Freitas (makeup), this duo created a look that would have children staring in awe and adults wondering how much and what type of hair product it took to add on five more inches to my five foot self! Outfit, of course, by ADORACION!!!! Look who attended and participated in the fashion show? My fabulous BFF, Debbie Friedrich, all the way from San Diego!!! Debbie, Cheryl and Brandy are also very close friends. Deb is their personal photographer and has documented many milestones in Cheryl and Brandy's adult lives including the marketing and promo photos for Adoracion! I was also sooo happy to see so many familiar faces in the crowd of Adoracion's family and friends. The Honeys, Dave Miyamoto and Michelle Guda, were there to join in on the festivities, informally document the celebration and support their Honey Gurl!!!! HOLLAH!!! Here's a little peek at the fashion show which showcased models wearing several of Adoracion's clothing, accessories and footwear. What's even cooler than the fashion teasers were the models who are Cheryl and Brandy's friends and family members. Aunty Bea shakin' it like a Polaroid Picture!!! Oh! And how's this??? Several of Hawai'i's top Chefs even participated on the runway!!! My co-emcee, Jo McGarry, introduced the Chefs. This is where "Food Meets Fashion!" Chef Guido Ullman of Waialae Country Club couldn't contain his boogie moves! Chef Jean Pierre Maharibatcha of O'ahu Country Club strutted his stuff! These guys were too hot even for their own kitchens!!! Yes, after partying like a rock star, I was losing my punk rock look...I unfortunately started to resemble a rooster!!! Oh! Thanks to my bro, Jonathan Freitas, for doing such a fabu job with my makeup, as usual!!! And the Hair Dream Team of Nicole, Eddie and Alison of Marina Kai Salon!!! A HUMGANOUS Congrats go out to Cheryl and Brandy for their vision, hard work and inspiration! And to all their 'ohana and friends who helped make this dream come to life!!! I can't wait for Wednesday, October 1st, when they open their doors for CHA-CHING...business!!! Thank you for allowing me to be a party of your fabulous celebration, ladies. AND for reminding all of us women out here that WE ARE HOT WOMEN!!! Here us ROAR!!!! Here's to continued success, happiness, knees high boots and my new love....SPANX!!!! Time for a visit to Nora! Yup! It's that time again! Another visit to my FABULOUS hair designer Nora Hong of Imagine That! in Kailua. I love Nora! She's such a kind, respectful and creative hair designer. It's always a treat visiting her! I have to really up keep this color and hairstyle. OMG! There is so much involved in looking presentable to the outside world! Next thing you know...all pau!!! MAHALO NUI LOA, Nora at Imagine That! Who's phone number is: 808-391-6672!!! You are da bestest and I can't wait to visit and laugh with you again!!! Aloha Tower meets Kanu Hawai'i!!! Holy camoley, people!!! This evening's TWC/Diva's Doing Good fundraiser for Kanu Hawai'i was DA BOMB!!! The turn out was fantastic! The afternoon started with a fun makeup session with my ever so talented brother-in-law, Jonathan Freitas (Makeup by Jon Freitas). He worked on both Aubrey and I. HELLO?!?!? No wonder why the makeup and cosmetic industry brings in billions of dollars!!!! Now we can confidently expose ourselves to the real world!!! MAHALO Jonathan for making us look like divas! I cannot even begin to tell you what a great time I had with my fellow J.U.Gettes! Olivia, Kalele, Aubrey and I excitedly entered the event and were greeted by so many happy familiar faces. So nice to run into Mr. Jet Setter himself, Derek Wong..
Aubrey and I were so honored to be chosen as one of the 50 Divas Doing Good. Each of the honorary Divas needed to do a video interview and give their mana'o (thoughts) on what Kanu Hawai'i means to them and what commitment they are willing to make. My main commitment: To help clean up Hawai'i's beaches! After we finished our interviews it was off to more grinds, hugging and laughing!! Great to see IMUA's Fred DeAngelo and his crew of Ola's volunteering their time, kau-kau and energies to a great cause! along with her equally stunning sister, Brandy Antonelis, joined in on the festivities as well. Ladies, be on the lookout for these two sisters! They're opening up their own boutique in Manoa Marketplace in October and it is going to be fashion heaven! I can't wait for Adoracion Boutique to open it's doors!!! Stay tuned for more exciting information!!! Okay, where was I...oh yes! On to the bar! You can ALWAYS count on a good time when Dave Miyamoto and his honey, Michelle Guda are in da house! I LOVED seeing CJ Bae with Kim and Tara! And I FINALLY got to meet the infamous Andrew Aoki, another Director for Kanu. What a cool guy!!! Here's my girls cheering the piece on! Isn't she beautiful??? Kalo...Please visit Ulu Art for more information! "To Inspire, To Reflect, To Change..."
During the event, I briefly saw Kelly Sugano of a Perfect Day running around with her very busy crew. I was so happy that Mary actually got to stop for a second for a quick photo. MAHALO, Mary, Kelly and APD Crew for all your kokua!!! It was great to see one of the contributing fashion divas, Allison Izu Song! We LOVE Allison! Goooo Lancer!!! And of course, a great big MAHALO to the main Diva and her INCREDIBLE TEAM! MAHALO for allowing me to be a part of a very significant and empowering event! Peeps, remember to PLEASE sign up with Kanu Hawa'ii at www.kanuhawaii.org. It only takes one commitment to make a difference! Aubz, Lele, Olives, Daiz, you gals are such beautiful women and the bestest gal palz EVER!!! MAHALO for a sensational time! We miss you Bee, Deb, KVN, Misty, Linda, Barracuda and Hawaiian!!! I was so stoked to receive a call from my good friend, Master P, asking me to assist by shooting several items of the new Hinano Beach clothing line. I'm not a beer drinker but have always LOVED the Hinano logo! C'mon! Who doesn't love one of Tahiti's most infamous symbols! Plus it also reminds me so much of our own beautiful island wahines. Here's Jenna modeling one of their cute tanks. Cute, yeah? Please check out Hinano Beach's website. Summer's coming, girls and boys! Time to get ready to look good!!! Special MAHALOZ to: my niece Lil' G for assisting on my shoot during such a windy afternoon at Kaka'ako Park. Crazy, good fun!! !